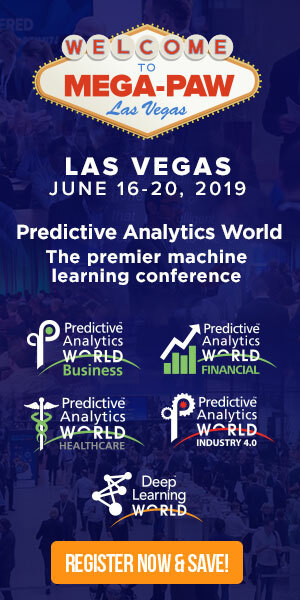 In anticipation of his upcoming Predictive Analytics World for Workforce conference co-presentation, Using Predictive Analytics to Reduce Unemployment Insurance Costs, we interviewed John Lee, Statistical Consultant at Equifax Workforce Solutions. View the Q-and-A below to see how John Lee has incorporated predictive analytics into the workforce of Equifax Workforce Solutions. Also, glimpse what’s in store for the new PAW Workforce conference. A: My solutions have been deployed in a variety of settings including marketing and HR. In some situations, these solutions are deployed into an automated production environment. In other areas, reports can be refreshed on an ad hoc basis. But in both situations end-users receive a report that helps them make intelligent business decisions. A: I think you have to start simple. The tendency I’ve noticed is to over-complicate things. If HR were 100% ready (and at some companies HR is ready in this way) I would look to marry together different sources of data and build solutions that offer value for companies (e.g. people analytics, compensation analytics). A: I think businesses are ready now. The argument that a random forest or neural network is more “black box” than a logit (for instance) is somewhat overstated in my opinion. For example, I think logit coefficients are confusing for most audiences and I always represent these estimates as changes in probabilities. A random forest or neural network is more challenging to interpret but in general you can create the same insights (e.g. predicted probability for a binary outcome). A: Focus on simple insights because business users don’t care about the complexity of your method, they care about the value your work brings to the company. So, for example, whether a data scientist is using a logit or random forest they should always produce simple graphics or tables that illustrate how businesses can improve their bottom line or the state of their workforce. A: Quite a few businesses already use churn models to understand why their employees leave. As an extension, some companies use predictive analytics to prevent the churn of top performers. Don’t miss John’s conference co-presentation, Using Predictive Analytics to Reduce Unemployment Insurance Costs, at PAW Workforce, on Monday, April 4, 2016, from 3:55-4:40 pm. Click here to register for attendance. USE CODE PATIMES16 for 15% off current prices (excludes workshops).